At the heart of the home, the kitchen is where food is abundant and memories are made, where friends and family are welcomed to gather, nourish and linger. To complete a new kitchen project with hospitality, efficiency and economy in mind, the design and construction decisions that must be made can be daunting. Whether contemplating a partial or complete kitchen remodel, or a new build altogether, cabinet materials and customization choices are among the most crucial to the project’s success. Cabinetry design is central to the aura of the finished room and choices made around their design and construction will likely have the greatest impact on the budget. While HGTV and Pinterest flood our feeds with great kitchen ideas, it can be easy to fall into the trap of buying into the latest trends. 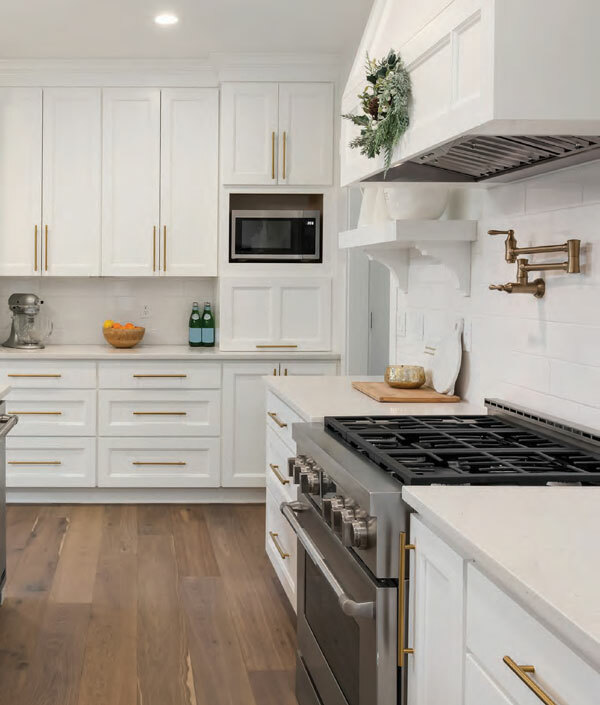 Sure, the Joanna Gaines-inspired farmhouse kitchen looks fabulous on Houzz, but how will that shiplap backsplash look in the kitchen ten years from now? Whether your ultimate aim is to enjoy this kitchen forever, or to build one with appeal to potential buyers should it be time to move on, a better plan is to opt for a design that will hold its style, keeping it classy for the long haul. Don’t be overwhelmed by the dizzying array of cabinet materials and products on the market; if terms like “laminate”, “stock” and “semi-custom” are outside your daily vocabulary, we’ll deliver the straight talk. Regardless of budget constraints, we’ll show you how to create a kitchen with staying power— one you’ll love for a good, long time, regardless of trends and fads. 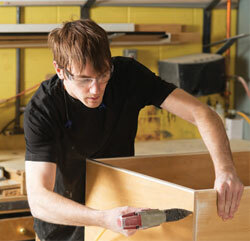 Stock cabinets are ones that come in “stocked” sizes—so there is little to no customization available. This was more of an issue when reigning kitchen style dictated that every nook and cranny must be fitted with cabinetry, but today’s open floorplans allow stock cabinets to function more intentionally. In an open kitchen design, if a stock cabinet doesn’t feel quite right for the space, many homeowners and design partners opt instead for open shelving—a stylish and practical option that delivers real cost savings. Most kitchen designers and cabinetry showrooms offer a la carte upgrades for their lower-end cabinet lines; some companies offer the option of adding a few pieces from a semi-custom line which can give a stock kitchen a bit more pizzazz. Not to be ignored are online sources, some of which offer proprietary design software for downloading. Finally, don’t discount local cabinet showrooms and architecture/interior design firms. Those professionals are often more able to direct time and attention to your project than designers at big box stores. With the benefit of a professional’s creativity and expertise, you may well end up surprised and delighted with a plan that addresses all your concerns around design, desire and cost. Across the board, semi-custom cabinetry is the most common choice of renovators and designers; it costs 25 to 50 percent less than custom and offers leeway for creative options—upgrades and splurges in an area or two—without full customization costs that can sink a project fast. Both semi-custom and custom cabinetry offer numerous opportunities for creative functionality. If this is the chosen route, taking time to shop around will prove worthwhile, as will asking design and product professionals outright how you can save money. If clean and uncluttered countertops are in your plan, there are countless cabinet inserts and gizmos that help keep counters tidy: “Charging stations for electronics, lift systems for mixers, spice drawers and racks and dedicated knife storage are some of the choices you’ll want to consider,” advises Stefanie Deel, an interior designer with Designer Solutions in Moneta. 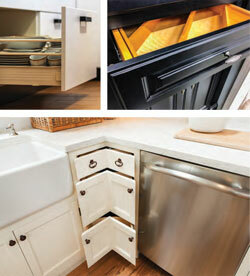 Stacked, pull-out drawers are popular for base cabinets, making it easier to find items stored within. Another approach is to incorporate partial overlay cabinets, in which the cabinet door doesn’t fully cover the box. Overall, experts agree that customers are generally cost-conscious and expect more than in previous generations. 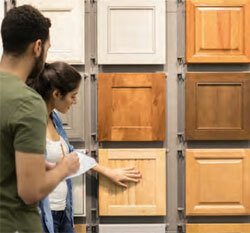 In response, cabinet companies have expanded product lines and many offer product levels of “good”, “better” and “best” within the same company. 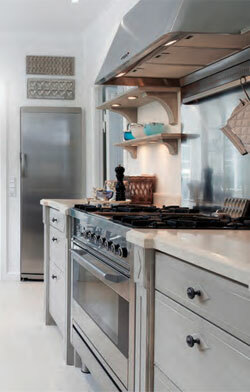 TREND: White perimeter cabinets with a contrasting island Try this: Opt for color throughout the kitchen. 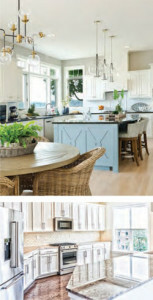 Does a blue kitchen suit you? Go for it! Try an all-white kitchen with contrasting countertop on the island, or a tuxedo kitchen with darker lower cabinets and lighter uppers. The contrast doesn’t have to be stark; varying just a few shades will do the trick. Try this: Avoid distressed or beadboard cabinets that scream farmhouse. Instead, opt for the clean lines of white Shaker cabinets. 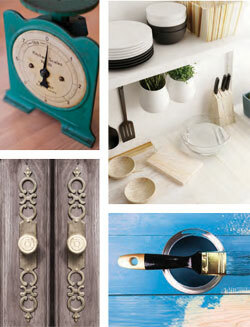 Layer accessories—antique signs on the wall or a vintage scale on the island. These things can be traded out later for a for a more modern look. Try this: If you’re not committed to open shelving everywhere, give it a try it in one area, maybe near the breakfast nook, in a butler’s pantry, or along one wall. You’ll still have closed shelving to hide what isn’t display-worthy. Try this: Light up glass-front cabinets from inside, with new LED strip lighting that doesn’t get hot, so streamlined that it can fit almost anywhere. Since you’re already showing off what’s behind glass, light it up for extra oomph. Try this: There’s no doubt that gray rules the day, but give it your own spin by warming it up with burnished brass or gold hardware. Also consider green or blue cabinets, which are making their way into fashion-forward kitchens. 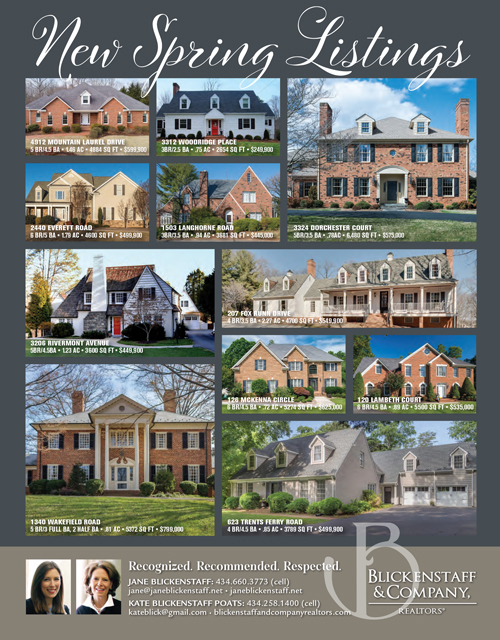 Across central and southwest Virginia, every kitchen designer offered similar trend guidance. “White kitchens are in demand and in style. Divinity white is our most popular color, a white that is toned down with a bit of gray,” says Hargis. While white kitchens are nothing new, “The white shade that is current is a cleaner white,” Hargis went on. “While 10 to 15 years ago a creamy or glazed white was in high demand, that subtle change between cream and clean can make older designs seem dated.” Distressed and antiqued cabinets are also on the way out, by the way, unless the look is particularly suited to the style or history of the house —say, a log cabin in the woods. Shaker and flat front cabinets look more current than raised-panel and ornate designs and even very traditional homes are settling on a more transitional style kitchen, with a cleaner look and less flair. The good news? Fewer details and flourishes mean less room for dust, food crumbs and spaghetti splashes to settle into, so keeping the kitchen clean is easier. A popular look for many years has been white perimeter cabinets and a contrasting island. When the trend first appeared a dark wood stain was popular for the island, but now various colors are taking center stage on the island, from navy blue to gray to green. Don’t look for the kitchen island to get lost any time soon, say our experts; as open floor plans’ popularity soared, the island became the kitchen’s anchor, workhorse and gathering spot. So don’t worry that your island might quickly become dated; Deel suggests, however, that a more current island option is all one level, rather than the multi-level models of recent years. As a bonus, single level islands tend to be more economical, requiring less customization of cabinetry. As kitchen islands deliver splashier color, look for appliances and wall coverings to follow, as homeowners become bolder with color throughout the kitchen. Many cabinet makers will match any shade from Sherwin-Williams or Benjamin Moore, so color choices are limitless. Popular in Europe is the flat front cabinet with a high shine, melamine finish, available in many colors and even patterns—wood grain, for example— offering durability and a sleek, utilitarian look. Along that vein, look for top-hinge hardware on upper cabinets to grow in popularity, especially in modern-leaning communities. Taking its cue from professional and restaurant kitchens, open shelving, whether bracketed or floating, has come into demand and offers versatility, storing everyday dishes in busy family kitchens or displaying pretty cookware, artwork, cookbooks and decor. 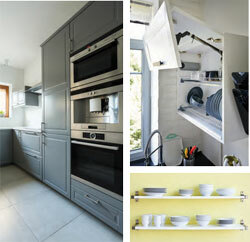 In home kitchens both traditional and modern, open shelving can work within almost any decor scheme.